The analysis, in the Lancet, found that our daily diet is a bigger killer than smoking and is now involved in one in five deaths around the world. Salt - whether in bread, soy sauce or processed meals - shortened the highest number of lives. Researchers say this study is not about obesity, but "poor quality" diets damaging hearts and causing cancer. So which diets have got it in for me? The latest analysis used estimates of countries' eating habits to pin down how often diet was shortening lives. Low levels of nuts, seeds, vegetables, omega-3 from seafood and fibre were the other major killers. "We find that diet is one of the dominant drivers of health around the world, it's really quite profound," Prof Christopher Murray, the director of the Institute for Health Metrics and Evaluation at the University of Washington told the BBC. Can a family learn to like the planetary health diet? How is this killing people? Whole grains, fruit and vegetables have the opposite effect - they are "cardioprotective" and lower the risk of heart problems. How far is the world off a perfect diet? No country is perfect and each favours some part of a healthy diet more than others, but this is how far the world is from an optimal diet. The healthy foods missing from the most diets around the world were nuts and seeds, according to the study. Eager readers will have noticed they featured heavily in the planetary health diet, unveiled in January, to save lives, save the planet and feed 10 billion people. So why don't we munch them? Prof Nita Forouhi, from the University of Cambridge, said: "The perception is they are little packs of energy that will make you fat, whereas they are packed full of good fats. "And most people don't see them as mainstream food; and the other issue is cost." Image caption Nuts - they are not just for squirrels. I thought meat and sugar were the bad guys? "These can be harmful as we show, but they are much smaller issues than low whole grains, fruit, nuts, seeds and vegetable intake," said Prof Murray. But is a tasty unhealthy diet worth it? But Prof Murray warns this is just the average and says the real question we should be asking is: "Am I going to die in my 50s from a heart attack? Or am I going to have some of the diet-related cancers in my 40s?" Are any countries doing well? 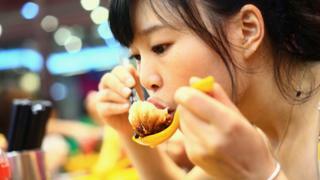 China consumes enormous amounts of salt with soy and other salty sauces being a key part of the country's cuisine. But the rising popularity of processed foods is introducing yet more salt to their diet. It has the highest death rate because of salt of any country. Prof Murray said: "Japan is very interesting because if you go back 30 to 40 years, they like China today had enormous salt intake. "And they have a diet that is higher in many of the things we think are protective for heart disease such as vegetables and fruit." The UK is behind countries like France, Denmark and Belgium. The biggest problems are a lack of whole grains, fruit, vegetables and nuts and seeds. The study estimates 14% of UK deaths are related to diet, with 127 diet-related deaths per 100,000 people a year. Prof Murray said: "Diet quality matters no matter what weight you are. "The really big story for people to act on is increase your whole grains, fruit, nuts, seeds and vegetable intake and reduce salt if you can." But money is an issue. It is estimated that having your five fruit and veg a day would take up 52% of household income in poorer countries. But Prof Forouhi warns: "The public can make healthier choices if informed and have the resources, but if what is on the shelves as buy-one-get-one-free is always unhealthy, then that message will fall down. "Cheaper options that are healthy are badly needed." Both agreed there needed to be a shift from focusing on nutrients (fat/sugar/salt) and on to which actual foods people should eat.